The weekly EIA working gas in storage report showed an 85 Bcf net withdrawal, bringing the total gas in storage to 1.745 Tcf. For the second consecutive week, the weekly withdrawal was a fair bit lower than last year (-124 Bcf) and the five year average (-131 Bcf). 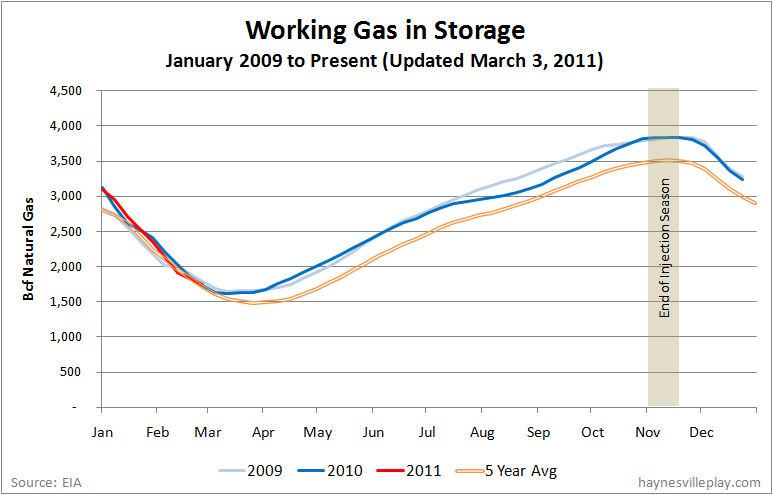 The current storage level is nearly the same as last year and the five year average. Temperatures last week were warmer than normal, averaging 40.3 degrees, 1.7 degrees warmer than normal and 3.3 degrees warmer than last year.